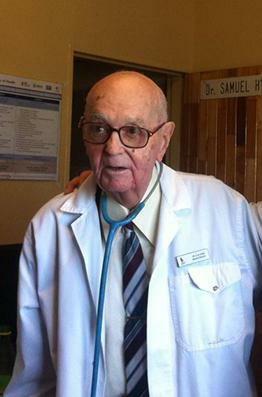 The popular doctor, Dr. Samuel Hynd, who oversaw the birth of King Mswati III of Swaziland, died peacefully while at his home in Swaziland, in the morning hours of Thursday, 18 August 2016. He was aged 92. Daughter, Elizabeth, said her father had not complained of either sickness or any pain. “On Sunday he was okay, I even took him for a ride and we passed by the church where we found a young woman preaching,” she said. Elizabeth added on Tuesday, he suddenly stopped taking food and liquids. She said they started to be suspicious that something could be amiss with her father. She immediately called her father’s closest friends and relatives who came for support and they sang hymns and he mumbled along. The following morning at around 5:30 a.m., her father stopped breathing. Like the patriarchs of old, Dr. Hynd simply folded his hands and ‘passed on to glory’. Dr. Samuel W. Hynd, CBE (Commander of the Order of the British Empire), was born on the 19th December, 1924, in the home of his grandfather, Dr. George Sharpe, the founder of the Church of the Nazarene in the British Isles. At the age of six months, he travelled with his parents, Dr. and Mrs. David Hynd, to Swaziland, where his parents founded the Raleigh Fitkin Memorial Hospital and the Manzini Mission Station. The later founding of schools and colleges made this the largest mission station of the Church of the Nazarene. Samuel Hynd returned to Glasgow for his medical studies, serving as District President of the NYPS and being one of the initiators of the annual conference-holidays known as ‘Institute’. He graduated in 1950 and was appointed a Nazarene missionary to Manzini, succeeding his father as head of station in 1961. After the independence of Swaziland, Dr. Hynd served as Minister of Health in the government of King Sobhuza II, and was later to be the doctor in charge at the birth of the prince who became the present king of Swaziland, Mswati III. Over the decade following his 80th birthday, Dr Hynd raised funds and established a new clinic to combat the AIDs epidemic. Dr Hynd was made a CBE by the Queen in 1998. Dr Hynd’s memorial service was held at Sharpe Memorial Church of the Nazarene in Manzini, Swaziland.